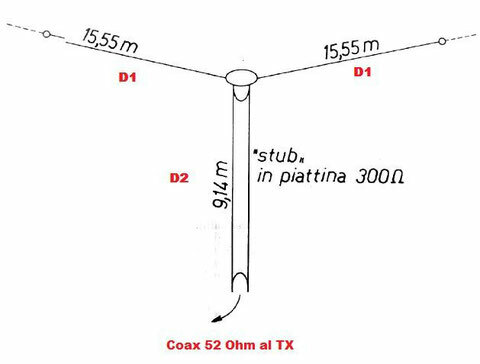 G5RV Antenna HF - iz0upss JimdoPage! 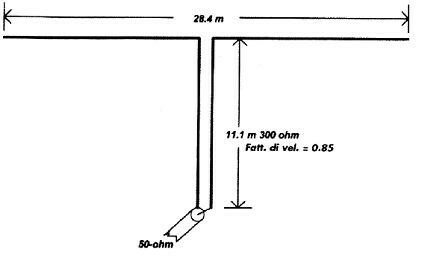 Questa antenna risuona sui 10-15-20-40-80. La configurazione a dipolo indica genericamente una polarizzazione orizzontale. della piattina a 300 Ohm. La G5RV, da buoni risultati, è un'antenna semplice, facile da costruire e da installare, in particolare in campo aperto per Field Day, vacanze, etc. Figure shows the popular G5RV antenna. Although not without some problems, this antenna is very popular. It can be used either as a horizontal dipole, a sloper, or an inverted-vee antenna (which is how I used it). The dipole elements are each 51 ft long. The feedline can be either 300- or 450-Ω twin lead. For 300-Ω cases, use 29 ft of line, and for 450-Ω line, use 34 ft.
One end of the parallel transmission line is connected to the antenna, and the other end is connected to a length of 50-Ω coaxial cable. 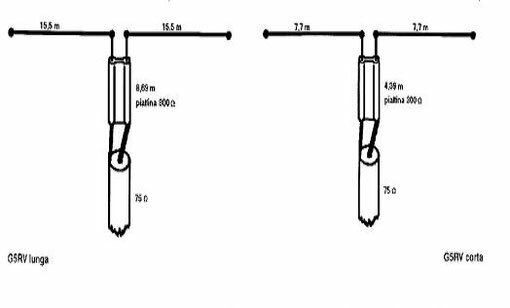 Although most articles on the G5RV claim that any length of 50-Ω line will work, J. M. Haerle (HF Antenna Systems: The Easy Way) recommends that the 50-Ω segment should be at least 65 ft long.